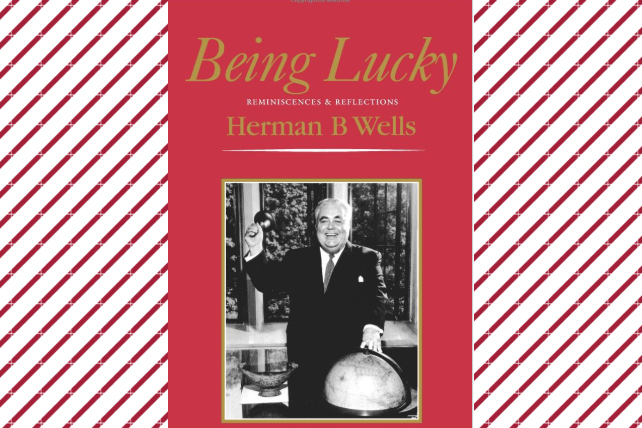 Herman Wells’ marvelous memoir, Being Lucky (1980), has never been published in full. Indiana University Press was founded by Herman B Wells in 1950. Since that time, the Press has become the largest publisher in the state of Indiana and showcases internationally acclaimed scholarly and popular books. It should come as no surprise then that Dr. Wells chose IU Press to publish his memoir. From the start, Dr. Wells, a skilled and engaging storyteller, wanted it to be richly sprinkled with vignettes, anecdotes, and reminisces about some of the notable people he had met on his travels and in Indiana: people such as Mohammad Reza Pahlavi, the Shah of Iran; Bhumibol Adulyadej, the King of Thailand; Wendell Wilkie, and J. Paul Getty. Generous Indiana families like the Lillys, Balls, Sweeneys, and Krannerts, whose gifts to Indiana University have made such a difference. And let’s not forget his whimsical Christmas message to IU students as Santa Claus. Now, thanks to the generous support of Bob and Billie Jo (B.J.) Kaufman, it will. "Of course, Herman Wells was always a big figure in our time," remembers B.J. "In a way, he was everywhere." Bob, too, remembers Dr. Wells walking across campus and talking with students. On campus together in the late 1960s, Bob and B.J. share memories of a place that was caught up in both war protests and the excitement of playing in the Rose Bowl. It is their recollections of this time that have inspired them to help Herman Wells tell all of his. Working closely with the University Archives, IU Press identified the missing portions of Being Lucky in Dr. Wells' personal papers and will now restore the memoir as Dr. Wells imagined it to be. The result will be a modern, digital edition, freely available to everyone, and expected to be released in time for IU Day in the university’s bicentennial year, 2020. B.J. (Briscoe) Kaufman, above on left, first graduated from Indiana University in 1971, and received her M.S. in 1974, again from IU. She met Bob Kaufman, right, at Indiana University, and the two were later married. 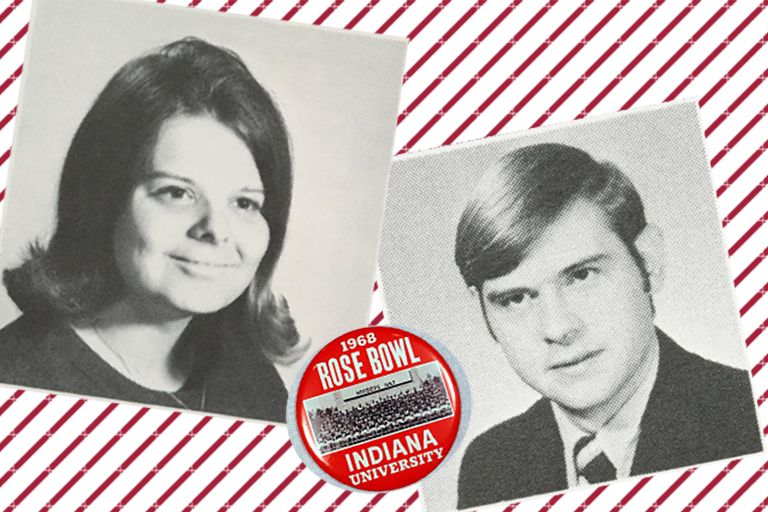 Bob was a member of the Indiana University Marching 100 and traveled with the band to the 1968 Rose Bowl, one of his favorite IU memories. 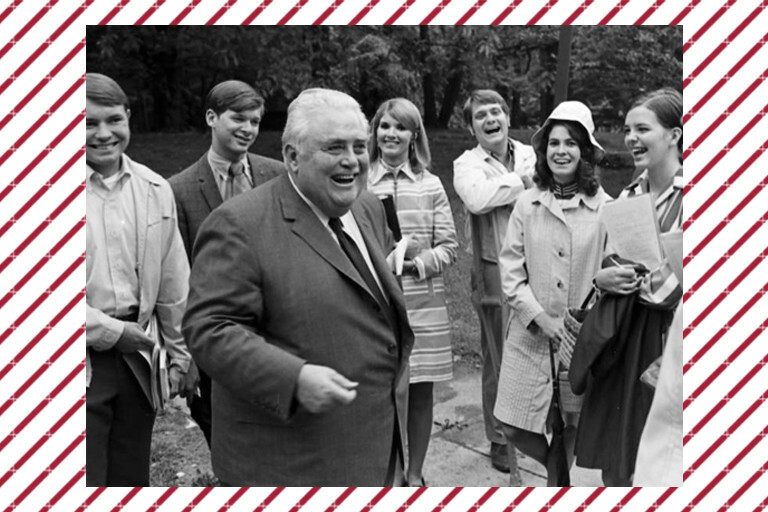 Image on page below is of Herman B Wells with the Hoosier Hosts in 1969. All images are from the IU Libraries' University Archives Photography Collections. Photos from University Archives online. Search "Rose Bowl" to see more. Such a restoration is both time consuming and costly. For this reason, Dina Kellams, Director of IU Libraries' University Archives is especially grateful for Bob and B.J. She said, "Archives, and archival collections, are here to invite scholars to reexamine and reinterpret history. While this full manuscript has been available here for many years now, publishing it in full will introduce Dr. Wells to a whole new audience, and one that is greatly expanded. These are stories he wanted to share, and now together with IU Press and the Kaufmans' gift we can make this happen." Gary Dunham, Director of IU Press and Digital Publishing, will be overseeing the restoration. He said, "Financial support from the Kaufmans will allow complete digitization of the original book, as well as for the professional copyediting required to re-insert the new material." After design and layout, the end result will be published through the Manifold Scholarship online platform and offered as open access material. The last time B.J. and Bob were at IU was in 2017 to mark the 50-year anniversary of the 1967 season leading up to the 1968 Rose Bowl. The two marveled at the many changes to campus, but also noted many familiar places. B.J. said, "Some things were exactly the same, like the Memorial Union. And some things, like Read Center, were touch points and brought back these same memories." The IU couple was on campus when the Herman B Wells Library was constructed, then known simply as the Main Library. As Indiana University Bloomington celebrates its bicentennial in 2020, this iconic structure will celebrate its own 50th anniversary. Also in 2020, the IU Press turns 70 and the Lilly Library will celebrate its 60th. Republishing Being Lucky as a digital, open access book is another way to move to the present while keeping hold to the foundations of the past. The Kaufmans are not shy to declare IU was part of the best time of their lives. Bob said, "We feel like our opportunities in life are because of our time here. Even meeting each other would not have happened without IU. Its something you look back and think about as the best time of your life, but we actually didn't even know it at the time." B.J. wants her gift to help remind students, "while you are at IU, try to take it all in, you don't get to do it again." Knowing Herman Wells wanted this material published was a big part of her decision to help. "He could drive kinda a hard bargain," she said. Just released! Audio files of Herman B Wells dictating never-published content he intended to be included in Being Lucky. Special thanks to the IU Media Digitization Preservation Initiative for digitizing these audio files.